Animal Charity Evaluators has looked into leafleting as a potentially highly effective intervention and of its standout charities, Vegan Outreach, specializes in leafleting. 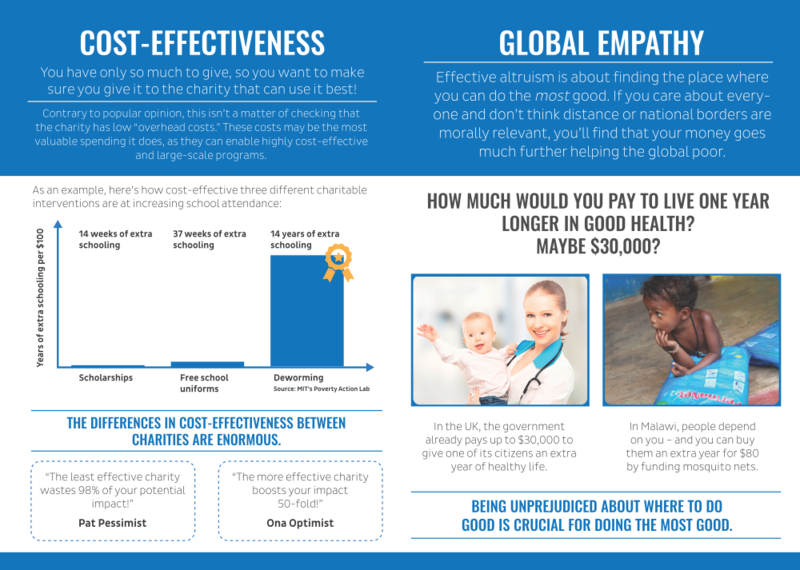 So we figured we should try out how well the strategy carries over to effective altruism outreach. The idea is to have a flyer for people who are already somewhat rational and altruistic and just have to learn about effective altruism. It is hard to convince people of rationality or altruism when they’ve lived good chunks of their lives remaining unconvinced of the value of them, and trying to achieve it on the four pages of our flyer didn’t seem feasible at all. The flyer has a call to action that asks people to open a website. We can track visits of that page as well as donations through that page. This August we distributed 770 flyers in total. We distributed 435 at GalaCon, a pony convention, where I handed out Maoam (sweets) with the flyers. We distributed 66 at Czequestria, another pony convention, where Ashley formed a series of small discussion circles to engage people with the content of the flyers. Finally at the Vegan Summer Festival, we distributed 269 flyers. In total we got two conversions, people who visited the website, and no donations. The conversion rate is thus at 0.3%. Both visits happened shortly after the Vegan Summer Fair, where our audience was very different from that at the pony conventions, so within this cohort we have a conversion rate of 0.7%. That’s €8–18 per conversion. It might be worthwhile to try this again at a university since the sample size is still small, since students are probably closer to the intended target audience of the flyer, and since I still have lots of flyers left. 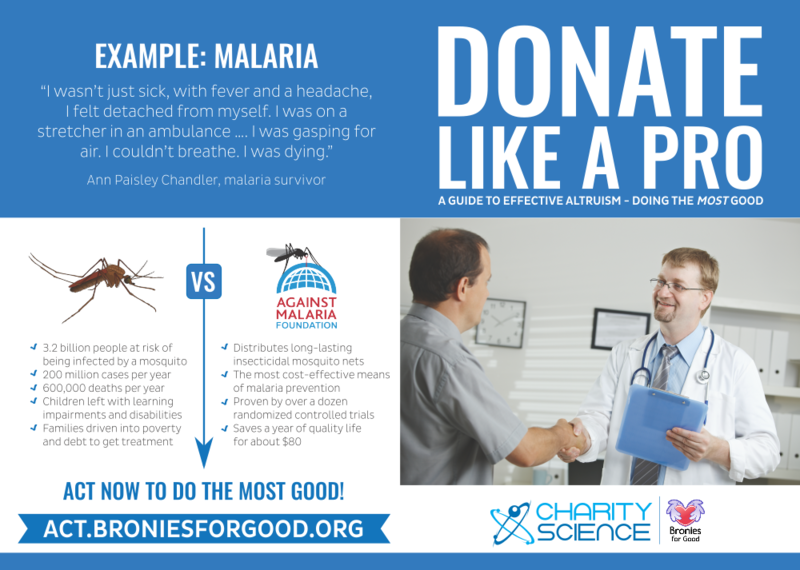 Tom Ash (representing Charity Science) and I created a detailed concept document for the content but otherwise only specified the format (A5 folded once) and that we wanted the design to look somewhat sciencey. Sandaru on Fiverr then made a custom price for us and created the current design minus some small tweaks that I applied. The process was quick and smooth apart from some slight language barrier issues. The first page is the outside of the flyer, pages 4 and 1, while the second is the inside, pages 2 and 3. The format includes 3 mm bleed on all sides. Please bear in mind that printers will usually want the files in CMYK, and that to get optimal results, you should convert it yourself and tweak the colors as necessary. I couldn’t get this to work in Inkscape and used Ghostscript to convert the exported PDF instead. You can replace the Bronies for Good branding with the branding your target demographic responds to. Please tell me your conversion rates.